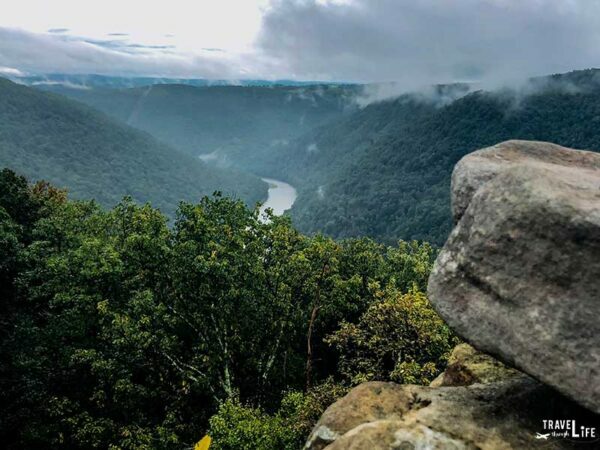 “Montani Semper Liberi: Mountaineers are always free.” Greater Morgantown, West Virginia includes the thriving college town of Morgantown, but also the surrounding Monongalia and Preston Counties. Many people will start with West Virginia University, especially if you have family or friends who are current Mountaineers or alumni. You’ll find a lot to do around the sprawling campuses of WVU but nestled in the ridges and valleys, you’ve got tons more to explore. 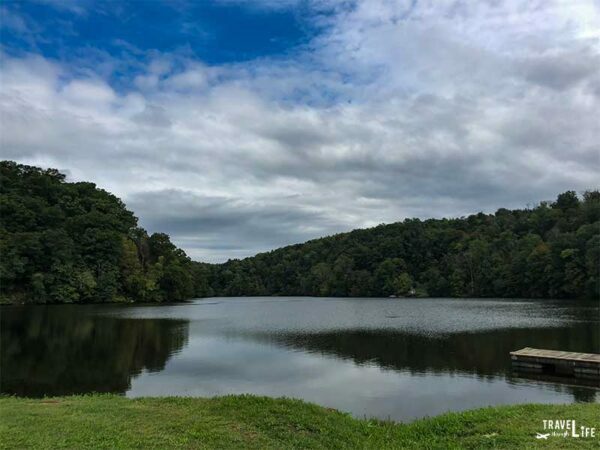 If you have a weekend in the area, here are some of our favorite things to do in Morgantown, as well as its Greater surroundings. Looking for more fun things to do in Morgantown and beyond in West Virginia? Check out our page dedicated to the Mountain State! Summer in Morgantown can get warm and humid, but that just means you’ll have to get in a boat on the Cheat or Monongahela Rivers. The best times for outdoor fun falls between mid-June and late September. Spring and fall are perfectly cool and crisp and there are flowers (April) and leaves (October) everywhere to see. Wet and cold winters just mean that the mountainous surroundings are perfect for skiing or just a getaway. Morgantown really is great for all four seasons, especially if you’re into different things throughout the year. You may have already known those tidbits and when to visit, but let’s go the important stuff. 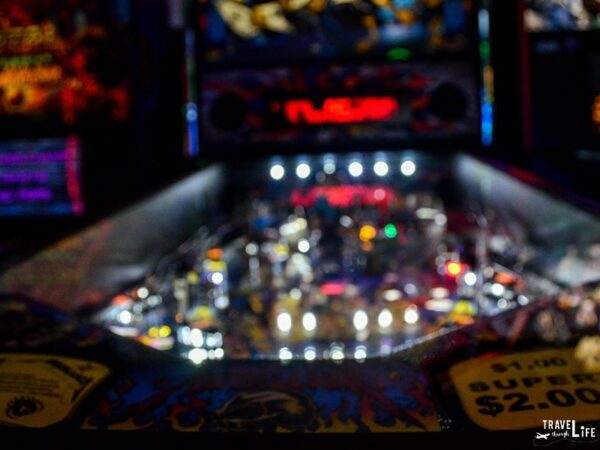 Here are our favorite things to do in Morgantown and its Greater surroundings on a weekend. West Virginia University (WVU) dominates the Morgantown scene, but not just for sports. The school has produced more than 20 Rhodes Scholars and WVU is well-known for many research accomplishments throughout the years. It’s spread across three campuses, connected by the Personal Rapid Transport (PRT). Hills are a-plenty, so if you’re into occasional 90-degree angle walks and leg workouts, WVU is the place for you. There are also some cool historic buildings at WVU. If you’ve only got time for a quick look, check out Martin Hall, Woodburn Hall and Chitwood Hall at Woodburn Circle (or oval, or quadrangle). 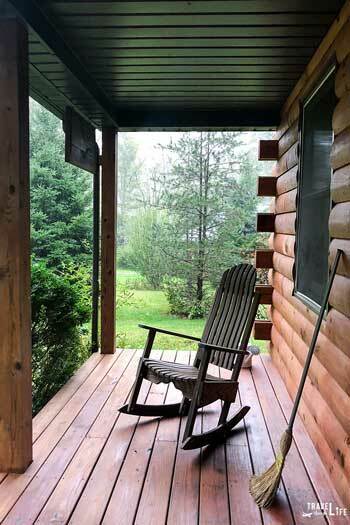 Front Porch living at Mountain Creek Cabins. You’ll easily find this out back from your cabin. If you’re looking for hotels near WVU, Hampton Inn has a couple of locations, with one right across from the main campus and another (& Suites) near Monongalia County Ballpark. The latter spot is where the West Virginia Black Bears play (See Family-Friendly). The Morgantown Marriot at Waterfront Place is another great place to stay. That hotel overlooks the Monongahela River and sits next to the WVU Visitors Center. 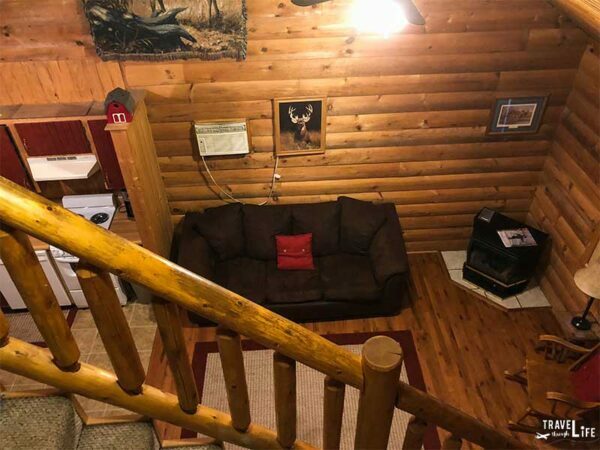 If you’re looking for something near Morgantown, but a little bit away from it all, try Mountain Creek Cabins near Coopers Rock State Park in Bruceton Mills. These beautiful and homey cabins are surrounded by awesome scenery and on the inside, you’ll find a relaxing place to chill out. Fuel up for your day of exploring with a coffee and a freshly made pastry from The Farmhouse Café or pull up a seat next to the Mon River Trail at River Birch Café. You can’t come to Appalachia without having some home cooking. And that’s exactly what is served up at Flour and Feed, with a twist! If you’re looking for a place to watch a game, head to Mountain Mama’s, a veteran-owned and operated brewpub serving the best wings you’ll find! Share a charcuterie and chorizo-poblano mac and cheese at Iron Horse Tavern, or be a little greedy and gobble down the Wild Mushroom Pierogis! Which of these places would top your food in Morgantown WV list? Don’t forget to check out The Greater Morgantown CVB’s Deals Page before you head out! Mountain State Brewing Co. Because beer should come served in a Mason jar. There are tons of bars in Morgantown and we’ll give you our favorite unique places to grab a drink. 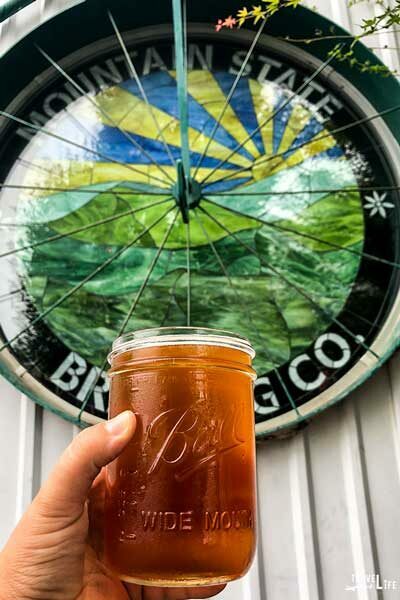 Craft beer in West Virginia started with Mountain State Brewing Company, where you should stop by, pull up a sawhorse, and drink a pint out of a mason jar along with their pizzas! Don’t forget about other great craft beer spots like Chestnut Brew Works and Morgantown Brewing Company, too! Enjoy local viticulture and grains at Forks of Cheat Winery and Distillery. There, you’ll more than 20 varieties of wine and moonshine favorites like Apple Pie. Starport Arcade & Pub brings the worlds of gaming and drinking together, and we can’t figure out which side shines brighter. 123 Pleasant Street is better known as a music venue, with an eclectic mix of acts coming through, but they’ve got drinks there, too! 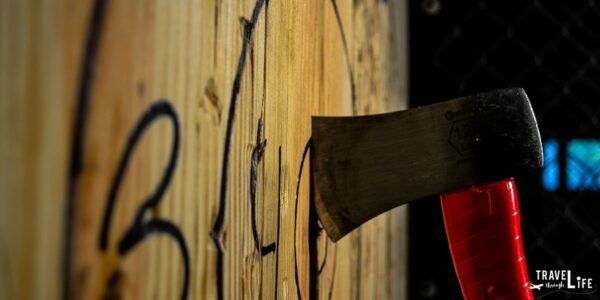 You can also bring your own beer and go beyond darts at Mountain Man Axe Throwing. I may or may not have absolutely loved doing that! Where else should one go drink in Morgantown? 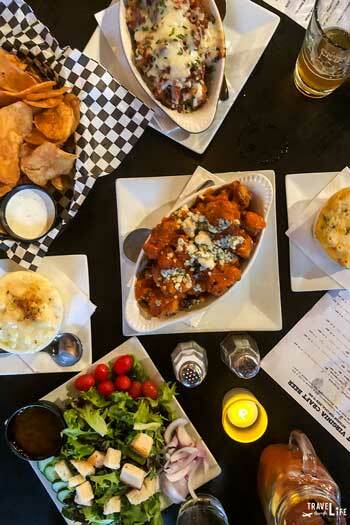 We share a few places where you can grab a drink and eat in Morgantown here! Coopers Rock. Such a beautiful view! With over 50 miles of trails, Coopers Rock State Forest is easily one the best things to do in West Virginia, not just Morgantown. You can hike, bike, camp, paddle or raft, and even ski here. No matter what you do, you have to get a look at the beautiful Cheat River from the top. Speaking of the Cheat, there’s a 4.5-mile Cheat River Trail that’s a part of the area’s famed rail trails. Paths like this run along the Monongahela River (Mon River) through Downtown Morgantown, including Caperton Trail. Looking for even more of a thrill outside? You can rappel, zip, and hike your way through the West Virginia gorges with WVU Zipline Canopy Tour. 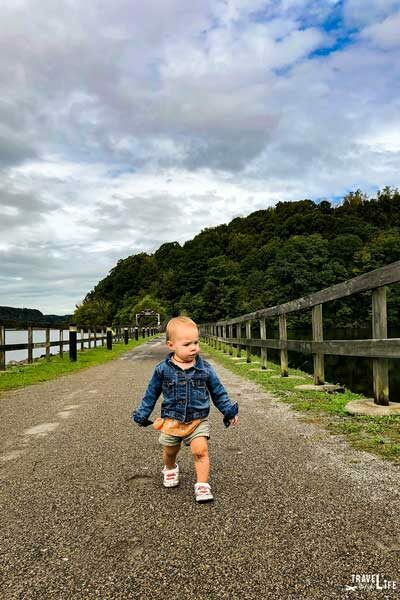 Even though it’s known as a college town, there are plenty of family-friendly things to do in Morgantown. You can start with a visit to Spark! Imagination and Science Center. Crawling babies, teenagers, and the young at heart can find something to engage their curiosity. Launch Pad Trampoline Park offers fun for everyone, with days and times dedicated to children with special needs and even adults. Hovatter’s Wildlife Zoo in Kingwood is home to lions, lemurs, bears, and more fun animals for you and the kids to see. Many people know Morgantown for WVU sports, but don’t forget about Minor League Baseball’s West Virginia Black Bears. They play from June to September at Monongalia County Ballpark in Granville. Do you really want to leave? At Cheat Lake. Explore Greater Morgantown’s surroundings and you’ll find tons of stuff to do. Pittsburgh is the largest nearby city, just an hour away. The Steel City is home to some great food, things to do, and more. Just don’t talk it up too much while in Morgantown (see Backyard Brawl if you don’t know). There are even a ton of small towns near Greater Morgantown worth checking out. Some awesome ones include Clarksburg, Bridgeport, Buckhanon, Elkins, Thomas, and Davis. For outdoor fun, Savage State River Forest in Maryland and Ohiopyle State Park in Pennsylvania are close by and full of cool stuff to do. 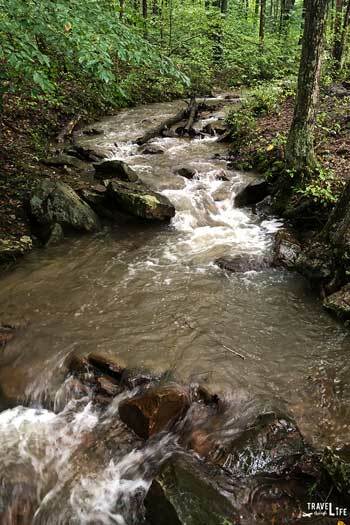 Looking for more places to visit in West Virginia? Check out our page specifically dedicated to the Mountain State! There might be some cool places nearby, but we think you’ll be exploring all the things to do in Morgantown. This is a place that we’ve both spent time in throughout our lives, but the first time together. Since we’re big fans of the Mountain State, I don’t think it will be our last. Of course, that’s also thanks to all the fun stuff happening in and around Greater Morgantown. Have you ever spent time in Morgantown, West Virginia? What do you like to do on the weekend here? What’s your favorite way to get out and enjoy this awesome town? We’d love to know in the comments section below! You can even extend your weekend into Monday in Morgantown and we created a post that will help you make the most of everybody’s least favorite day of the week! Special thanks to the Greater Morgantown Convention and Visitors Bureau for providing us with accommodation and meal assistance while visiting. All opinions within this article are our own. Nice post, I’m planning a trip to the US next year so I will have to add the Cheat River trail to my bucket list! Thank you so much. I hope you can make it to this part of the world someday. It’s definitely worth visiting!